I recently read The Guernsey Literary and Potato Peel Pie Society and was surprised to find out that it was told in letters. I had no idea! I’d heard a number of people I trusted as readers with similar tastes to me say it was an amazing read. It had popped up on a bunch of lists as a comp title to books I loved. None of these mentions of it, that I can recall, said anything about it being written in letter rather than in a narrative format. That got me thinking. What other novels have I read that written in an epistolary format? I just read this book, and oh goodness, it was lovely.Now that World War Two is over, a writer in London, is looking for a topic for her next book. She begins corresponding with members of a book club on the Island of Guernsey that was occupied by the Nazis during the war. Each character’s voice comes through wonderfully in this collection of letters. A conversation told by letters between two demons, one an old, experienced tempter and the other a novice about how to sink a human. It is a very interesting read and definitely makes you think. Twinkle wants to direct movies. So when the brother of her crush asks her to work with him to make a movie for the local film festival, she heartily agrees. Make her directorial debut AND get to spend time in the house of the boy she likes? Heck yes! Alas, not everything goes as planned in this adorable YA romance. The story is told through letters Twinkle writes in her journal to famous female directors. Published in 1912, this book is one of the oldest on this list. It is a sweet read. Eighteen-year-old Jerusha Abbott, an orphan, is sponsored by a wealthy gentleman to go to a girls college. The only stipulation: she will never know who he is, but she must write to him about her progress at school. She nicknames him Daddy Long Legs and addresses her letters as such. Told in daily logs, this is the experience of Mark Watney, an astronaut stranded on Mars. And he’s a botanist. The movie was great. As usual, the book was better. Rather than die alone, he figures out how to repair the machinery, grow food, and even contact earth to arrange a rescue. Lincoln O’Neill works in IT. But he has possibly the worst job ever. His job is to read emails caught by filter of non-work content. In doing so, he “meets” Beth and Jennifer, two women who work in the newsroom upstairs and continually use their company email for personal conversations about every aspect of their lives. Rather than report them, Lincoln falls in love with Beth…but how does he tell her if he’s never actually met her? I’ve read this book so many times. It’s adorable. How did I not know this book existed?! This is the only book on this list that I haven’t read. But it’s by Jane Austen, so I must read it. Lady Susan is said to be the first novel Jane Austen finished but wasn’t published until years after her death. It tells the story of Lady Susan, a widow seeking a second marriage for herself and a first marriage for her daughter. I don’t always love novels in which the story is told through letters from or between the characters. Sometimes they work for me. Sometimes they don’t. I think the ones that work best for me are the books that include letters written by numerous characters, rather than just one. I find I’m better able to get to know each character in the story better. And, I’m that much more impressed with the author for creating distinct personalities and voices that come through in the letters of each character. Guernsey was definitely one of those books. 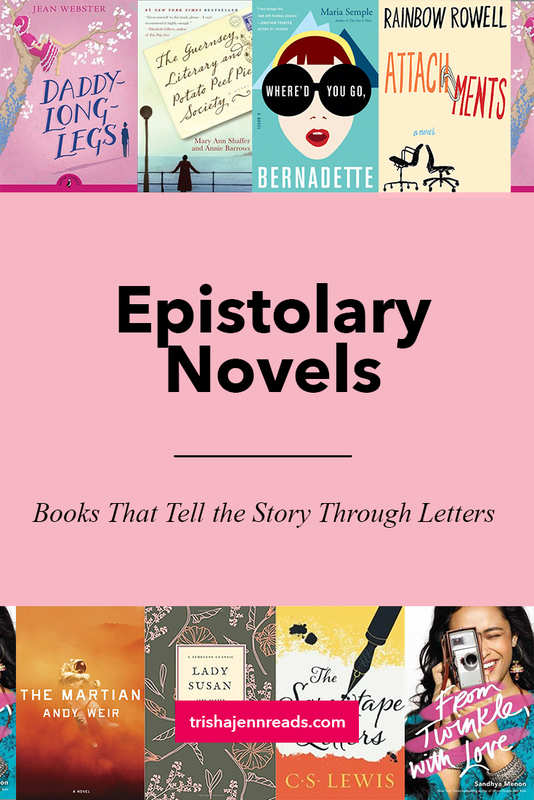 If you’re interested in reading more epistolary novel, check out Book Riot’s post 100 Must-Read Epistolary Novels from Past and Present. So many great books are told through letters between the characters.